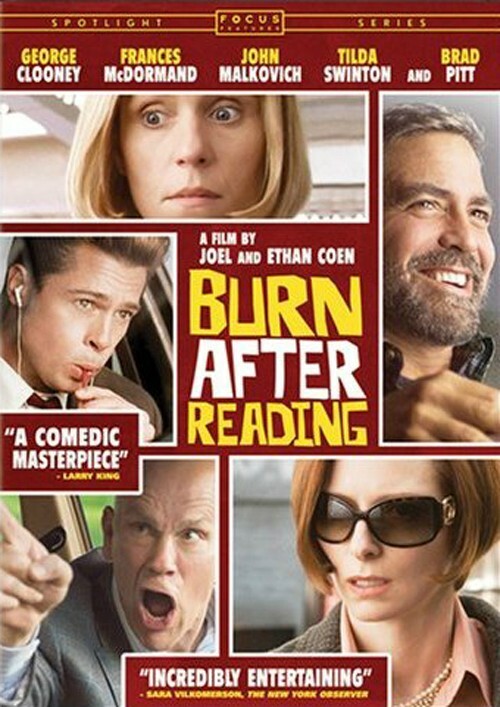 Buy, Rent or Skip Burn After Reading? Apparently Burn After Reading is a great movie. It seems to get a lot of recognition from those that are true die-hard fans of The Coen Brothers. I'm a fan of theirs for sure and like many of their movies. But I honestly don't think this even comes close to their best work. It's not that Burn After Reading is a horrible movie. It was just....disappointing, underwhelming and boring. With the exception of Brad Pitt, there really wasn't a single character that I even remotely liked at all. You would think a movie sporting the likes of Pitt, George Clooney, Frances McDormand, John Malkovich and Tilda Swinton would have knocked this one out of the park. But you can't ask an actor to do more than what is on the written page and I just don't think The Coen's delivered here. Hey, maybe I'm in the minority here and the rest of you cats actually dig the movie. I know for a fact that I will never bother watching this one again, even if I stumble across this while channel surfing. This is a Skip. 2 Stars out of 5. The chair that George Clooney built kills me. But until you mentioned this movie I didn't think about it at all.